Ron was from Lexington, Kentucky. 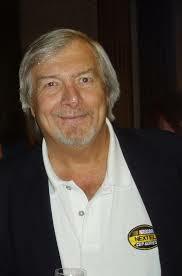 Beginning his radio career as a teenage deejay there, he went on to become the manager of Orlando’s WHOO (1967) and vice-president of group owner Bluegrass Broadcasting. In the late 60’s, he took the sales manager’s position with Drake Chenault, and later TM Productions in Dallas. During his time with TM, he took a year off in the mid 70’s to manage Gulfstream Broadcasting’s Florida radio stations, owned by longtime friend Ron Crider. In the early 80’s, Kenny Rogers recruited him to head up a new company to produce national TV shows. The first, “The Spirit of America Spectacular,” was July 5th 1981, part of a live simulcast on national radio and TV, and hosted by deejays Wolfman Jack and Charlie Tuna. It featured performances by Three Dog Night and The Beach Boys, among others, and originated from the site where the Queen Mary was permanently docked in Long Beach, California. In the late 80’s Ron returned to radio broadcasting in Virginia Beach as vice-president and operations manager for all 40 of Willis Broadcasting’s stations. He moved to Colorado in the 90s and managed stations in Steamboat Springs, Gunnison, Breckenridge, and Denver, and in 2005, became general manager of the Radio Colorado Network group of stations. Since the age of 15, he had been an active Ham Radio Operator, and communicated with thousands of fellow Hams worldwide, including the late King Hussein of Jordan. Along with broadcasting, he also maintained a passion for auto racing. Ron passed away at Exempla Hospital in Lafayette, Colorado May 15, 2011 from complications related to several strokes. He was 69.